Originally documented in 893, Trittenheim is probably even older in origin. The menhir "Eselstratt" and "Galisberg" on the Laurentius hill indicate a settlement on the plateau in Preceltic times. The name ending "-heim" however is of Franconian origin, and is supported by the Franconian name "Tritto". 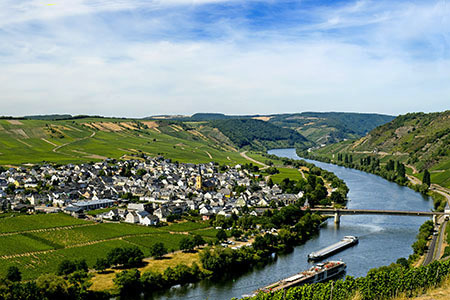 The place is surrounded by vineyards, and lies directly on a narrow, long promontory by the narrow Mosel loop. On this promontory, in a vineyard, lies -a bit outside of Trittenheim- the St Laurentius chapel with a chancel from 1583 (documented in 1569). A bridge crossing the Mosel has only existed for about 100 years, before that the shores were connected by ferry. The two ferry towers, which held the guide rope of the ferry from one side of the Mosel to the other date from this time. The oldest part of the ferry towers dates back to 1740. At the bridge a monument reminds people of Johannes Zeller, who was born here in 1462. Trittenheim is famous for its fine wines, and names like Trittenheimer Altärchen or Trittenheimer Apotheke make every wine lover sit up and listen. The best view over the village, the Mosel and the vineyards can be seen from the opposite side of the Mosel (Prallhang), where the Hunsrück mountains rise steeply: on the "Zummethöhe" you get a unique panoramic view of the variety of the vineyards that are graduated from flat to steep. On the "panorama path" you can walk around the loop above the vineyards.